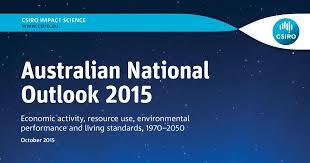 The National Outlook is a ground-breaking attempt to model and analyse Australia’s physical economy and natural resource use out to 2050. This report provide the most comprehensive analysis of its kind. It focuses on the emerging water-energy-food nexus, and the prospects for Australia’s energy, agriculture and other material intensive industries, with particular attention to potential synergies and trade-offs within and across economic sectors.